I’m in Corvalis, Oregon (go beavers!) this week attending the International Conference on Biological Ontology & Biocreative (ICBO) 2016. Highlights so far: Chris Daly’s talk on the work of the Prism Climate Group; Amanda Hicks and Bill Hogan’s workshop on social entities; and my workshop (co-chaired with Mathias Brochhausen) on institutional roles, deontic powers, and parthood axioms (paper tk). It has also been good to see the wealth of initiatives in developing evidence ontologies. I was thinking today how much of the language intellectuals use to describe our place in history has changed, and in particular, how I don’t hear the word “postmodern” thrown around as casually as I used to a decade ago. Curious whether or not I could find evidence for this change, I went to Ngram–as I am apt–and ran some searches et voila! Theory confirmed. Looks like 1998 was the ebb. What happened? Did reviews of Radiohead’s Ok Computer and the Matrix movies overuse the term, and 9-11 sweep away our Baudrillardian/Foucauldian concerns with representations and power by making our fears seem suddenly too immediate? Dale Dorsey has a nice guest post on the Daily Nous available here. He was hired at the University of Kansas not long after I graduated, and I was sorry to have missed him and have enjoyed his writing since. The metaphor he uses here of many thinkers building a kind of atlas of theory is a timely one. Great bit by John Oliver on reporting on science in the media. In Barry Smith’s analytic metaphysics course this week I presented some of my work on a game theory ontology and a potential application. See a video discussion below. (The class session only allowed for twenty-three minutes for both presentation and Q&A so hang on because I talk a little fast!). I also refer in the slides to work by Bruce Bueno de Mesquita, which can be found discussed here. Questions came from Brian Donohue, John Beverly, Uriah Burke, and Ben Lawrence. Here is a chart from Google’s Ngram showing the frequency of “Game Theory” and “Decision Theory” over the last few decades in published books. Interesting to note the drop from 1970s through the 80s that then re-emerges, I imagine, due to the rise of modern computers–all while “Decision Theory” has a small hump in the 70s and undergoes a steady decline. The discussions of matrices also seem less important now than they must have seemed previously, while the discussions of decision trees has become increasingly important. Perhaps “decision trees” are also a synonym for flowcharts? Tyler Doggett (University of Vermont) and the good people at Wireless Philosophy put together this captivating and compelling video on the ethics of raising animals to be used as food. If you feel there’s nothing wrong with eating meat (or if you have an interest in the ethics of eating), take a few minutes and watch. I’m in the process of putting together a medical ethics syllabus for a summer course at UB. It will cover issues at the ends of life (abortion, end of life care) and arguments concerning the goals of the medical profession, but I also hope to look at some issues in moral enchancement that more often come up in courses in neuroethics. Since the course is an online course, I would be interested in web links to videos and online content on these subjects. 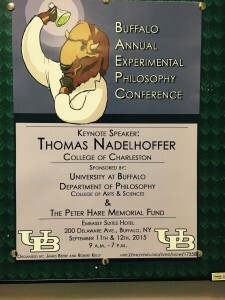 The Annual Buffalo Experimental Philosophy Conference kicked off yesterday with some great talks and an excellent poster session. I’m struck every year by the workshop-feel of the conference, a feeling that continues to persist despite the conference getting bigger than in previous years. I’m also happy to see many more talks in moral psychology alongside talks on epistemic modals and knowledge attribution. Thanks to all those who provided helpful feedback on my work on folk judgments concerning promises. Catherine Nolan put together this fun poster for the Blameless Buffalo? Conference this upcoming Friday and Saturday at SUNY-Buffalo. I think the lying down position should have been reserved for outright fatalists, but I suppose I play that role from time to time.